Lumbar Plexus is located in spatial psoas muscles .the antetheca of spatial psoas muscles is psoas muscles ; and the parries posterior are 1-5 transverse process of lumbar vertebra , intertransversarii and intertransverse ligaments ; the lateral are the psoas muscles fiber and quadratus lumborum which are from transverse process of lumbar vertebra ; the medial aspect are 1-5 body of lumber vertebre , lateral lumbar intervertebral disc and psoas muscles of centra.the antetheca of spatia psoas muscles upper bound 12 costa , downward and following the lumbosacral cord stop at anterior diastema of pelvis .the nervus femoralis from plexus lumbalis , (L1 nerv and L2-4 ) , lateral femoral cutaneous nerve (L2-3) , obturator nerve (L3-4) , gentiofemoral nerve ( L1-2) ,nervus iliohypogastricus and nervus ilioinguinalis (T12-L1 ) . After apinal nerves of lumbus make perforation from vertebra, start to make Courser at 1.5cm-2cm where located in the anterior aspect of transverse process and tie line .Lumbar Plexus Block will general progress in L2-3 or in L3-4 the gap of transverse process. 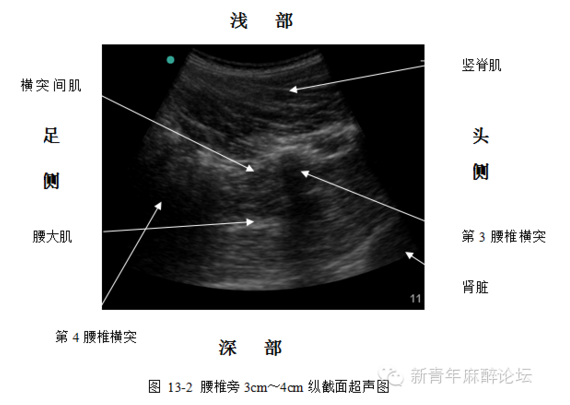 For adult application , please choose convex array probe ,and adjusting the depth to 7cm-10cm .For children application , please choose linear array probe ,and adjusting the depth to 3cm-6cm .Lumbar plexus located in deep position ,sometimes is very hard to discernment ,but we can get to know the location base on the structure which surrounding.Lumbar plexus is not a single nerve so you cannot describe it by long axis and minor axis. Only can use transverse section and longitudinal section to represent it according to the direction of ultrasound probe and spine. longitudinal section :on superior extremity of No2 or No 3 transverse process of lumbar vertebra ,the ultrasound probe should be perpendicular to the direction of vertebrate column , the other side of ultrasound probe should be at the middle of back , move the ultrasound probe towards head direction then you will see the transverse process image .You will see the horizontal image of middle transverse process when you translatory move the ultrasound probe towards the foot side in 1 cm.Top muscle is the erector muscle of spine ,the outside of it is the lumbar quadrate muscle.Below the juncture of two muscle is greater psoas muscle .The lateral of greater psoas muscle is kidney .low echo area in the medial side of greater psoas muscle is the centrum .Between psoas muscle and centrum is the interspace of psoas muscle.The cutaneous nerve of thigh ,femoral nerve and obturator nerve cross the psoas muscle.The borderline between them and psoas muscle are unclear . 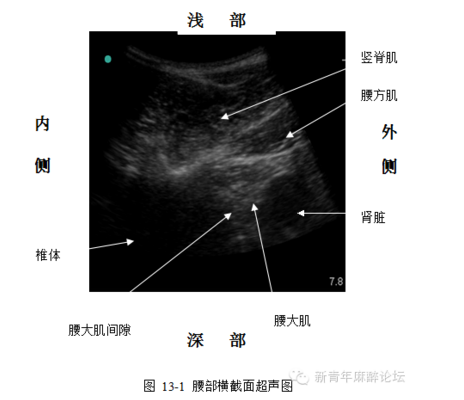 we can use plane technology when we want to see the transverse section (see picture 13-1) insertion of needle from lateral ultrasound probe ,needle cross the skin , subcutaneous tissue , erector muscle of spine ,lumbar quadrate muscle and psoas muscle ,then reached the interspace psoas muscle(see picture 13-3)The advantage of this operation method is we can see the whole process of needle crossing in real time .The disadvantage is the drug will extend to epidural cavity and then will easily cause bilateral block .